The smooth handling superline. 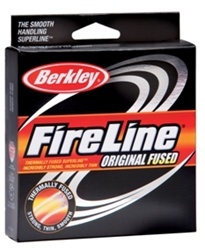 Advanced technology FireLine Original Fused line is now 20 percent stronger than before. This thermal filament casts more easily, ties better knots, and stays more hassle-free than conventional braids. Along with exceptional strength, FireLine delivers ultimate sensitivity for instant feel, and the ultrathin diameter provides low visibility and incredible lure action. Size > FLFS14-42 125yd Smoke 14/6 Lb. Test/Line Diam. Size > FLFS6-42 125yd Smoke 6/2 Lb. Test/Line Diam. Size > BFLFS8-42 125yd Smoke 8/3 Lb. Test/Line Diam. Size > FLFS20-42 125yd Smoke 20/8 Lb. Test/Line Diam. Size > FLFS10-42 125yd Smoke 10/4 Lb. Test/Line Diam. Size > FLFS30-42 125yd Smoke 30/12 Lb. Test/Line Diam.